Have you ever been reading a material data sheet and wondered what ASTM means? Well, you’re not alone. “ASTM” followed by numbers or letters is used on data sheets to indicate the test used to develop the data. These tests are standardized so that they can be reproduced by labs around the world. Here’s a brief rundown on ASTM International’s history and operations. ASTM is an international standards and testing organization with headquarters in West Conshohocken, PA and offices in Belgium, Canada, China, Mexico and Washington, D.C. It was founded in 1898 by a group of Pennsylvania Railroad engineers and scientists, led by chemist Charles Benjamin Dudley, to address the frequent rail breaks in the fast growing railroad industry. Originally called the “American Society for Testing and Materials”, it changed its name to “ASTM International” in 2001. The association has more than 30,000 members, classified as users, producers, consumers and general interest. The latter are usually academics and consultants. ASTM develops and publishes technical standards that are arrived at through consensus and used on a voluntary basis for a wide variety of products, materials, systems and services. To date, some 12,000 ASTM standards are used around the world with 143 technical standard writing committees. The standards are developed in accordance with the guiding principles of the World Trade Organization which include “coherence, consensus, development dimensions, effectiveness, impartiality, openness, relevance and transparency.” ASTM internal standards fall into six categories: Standard Specification, Standard Test Method, Standard Practice Guide, Standard Classification and Terminology Standard. Each year ASTM International publishes the Annual Book of ASTM Standards. This set of standards is contained in some 80 volumes and includes standards for plastics, adhesives, and rubber as well as iron and steel, nonferrous metal, metal test methods and analytical procedures, construction, textiles, electrical insulation and electronics, water and environmental technology, nuclear, solar and geothermal Energy, medical devices and services, and many others. Along with the development of consensus based standards, ASTM International offers technical training programs for both industry and government. It also does proficiency testing and inter-laboratory crosscheck programs. Their Proficiency Testing Programs are statistical quality assurance programs. Laboratories can assess their performance by comparing their data to other laboratories who participate in the same worldwide program. Proficiency Testing Programs include plastics and metals testing as well as aromatic hydrocarbons, petroleum products, engine coolant, octane, and textile testing, to name a few. ASTM also offers training programs including continuing education or on-line training. Continuing educations includes courses on plastics, coal, statistics, glass, rubber, and textiles. True to its origins, ASTM offers online self-guided training courses for QA/QC technicians in the construction industry in such areas as cement testing, concrete strength testing, and aggregate testing. ASTM provides onsite training as well. ASTM also offers certification programs that cover products including materials, systems and services as well as personnel to demonstrate via an independent third party compliance to standards. Two of these are the USDA Voluntary Bio-based Product Labelling Program and National Center for Aerospace & Transportation Technologies. ASTM does not participate in requiring or enforcing compliance with its standards. However, contracts with corporations or governments may specify compliance to a particular standard. For example, all toys sold in the United States must meet the specifications of ASTM F963, the Standard Consumer Safety Specification for Toy Safety per the U.S. Government Consumer Product Safety Improvements Act of 2008. Questions? Comments? Let me know in the comments section below. Looking for more information on standards? 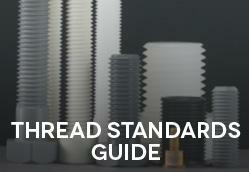 Download our free Guide to Thread Standards! « Which Plastic Material is Used in Lego Sets?